Having been a bit lax about posting lately, I’ve given myself a pinch this week. I started this blog and want to continue it because a) I want to post things that I think others would find interesting/ inspiring/ helpful and give something back to the huge online pool of amazing talent and work that I dip into so much, b) I have a poor memory and need an easily accessible archive full of images to remind myself what I’ve been doing and making and c) my self-motivation varies hugely from obsessive and hyper about getting something done to chewing nails and staring into space – I wanted a long-term project that would keep both it and me going. However, being in that uninspired, flat state of mind makes it difficult to write or photograph or DO anything. So.. the point of this particular post is to have a regular feature that I have to post every week because ..otherwise that bomb on the bus*/ milk float** will go BOOM!! and Bruce Willis*/ Father Ted** won’t be around to help this time. Every Thursday I’ll post a new design with a little bit about its source of inspiration. The design might be taken directly from a historical piece of knitting, adapted from another medium e.g. ceramics or emerge from the jelly-like substance of the sea on the surface of the planet Solaris. 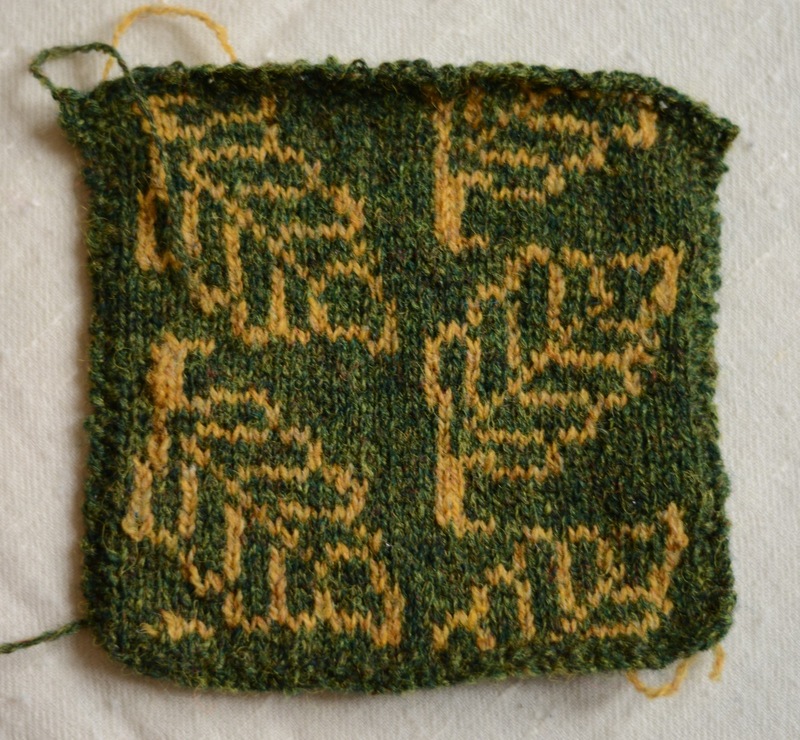 A new knitting pattern, taken from a piece of embroidery in Hardwick Hall, Derbyshire. The yarn is Jamiesons of Shetland spindrift in ‘moss’ and ‘scotch broom’. Detail of a framed cushion cover of crimson silk worked in long-armed, cross or tent-stiches with various types of oak leaves. From the Paved Room, Hardwick Hall, Derbyshire. love your interpretation of the leaves and bruce willis and fr. ted in the same breath ? i had a good laugh! !